A riveting investigation into the nature of humans to seek, to search, and to understand by discovery. Biographer Monty Joynes has crafted a compelling biography of an amazing family, the Fishers, combining technical content and personal anecdotes, against a larger historical and geographical backdrop. 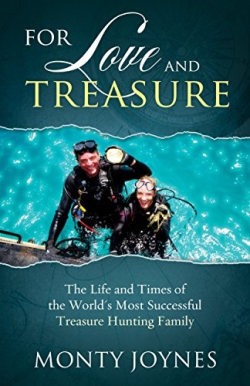 If you’ve ever wanted to hunt for treasure, or you wish to vicariously embark on a daring adventure beneath the surface of the sea, For Love and Treasure: The Life and Times of the World’s Most Successful Treasure Hunting Family awaits. Joynes, a veteran author, provides an intimate glimpse into the lives of people like Kim and Lee Fisher who defied a conventional life in favor of uncertainty, but guaranteed adventure. With plentiful captioned photos, it is almost like reading a personal narrative and family album simultaneously. Yes, indeed, this is a story of discovery—the discovery of fabled wreckage, like the Fishers’ 1985 headline-grabbing success in securing treasure from the 1622 wreckage of the Spanish Nuestra Senora de Atocha. But it is also a story of self-discovery, and the awareness needed to understand one’s own self and to live the life one has imagined, which is itself a treasure.